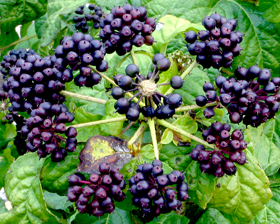 Woody perennial with spiny stem and clusters of blue-black berries. Native to cold northern lakeshores and woods of China and Siberia, this plant grows best in shade garden, where there is rich soil and plenty of water. Height 2-4m. Seed requires 2-3 months warm followed by 1,5-2 months 0-3C cold stratification. Prick out the seedlings into individual pots when they are large enough to handle and grow them on in light shade in a cold frame or greenhouse. Plant out in late spring or early summer.